Hooray! More writing from you is always good news for us. It’s day 2 of NaNoWriMo and I’ve STILL NOT MADE UP MY MIND whether to do it or not. Yesterday was still hosting motherly visit. Today, um… blogging in lieu of deciding. We’ll see. Anyhow, I’m delighted we’ll be hearing from you more. =) baby steps are GOOD. ooh you should do it! i can nag you, kindly of course 😛 it’s a really great feeling when you get to the end, promise! The logo made me laugh! That’s a good thing in a graphic. I signed up for NaNoBloPloMo (did I get that right? ), but the schedule looked freaking intense. I requires daily blogs on complicated topics. I was exhausted just looking at the list. I think it would be ok if blogging was your job and you were running out of ideas. That is the coolest logo evah!!!! 🙂 Looking forward to reading more witty posts from you! Just finished reading your diet girl book…it is really quite wonderful. Yay! 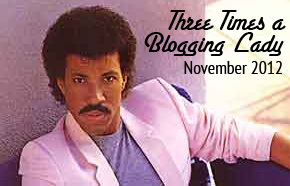 Thrilled to get 3 posts a week.. and Love a bit of Lionel! Looking forward to three posts a week! I found if I stuck to 1/week, blogging was sustainable. Any more and it was too stressful what with holding down a real job and all!